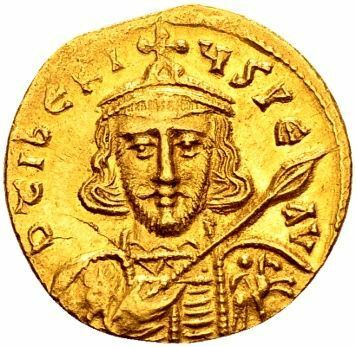 Tiberios III was Byzantine emperor from 698 to 21 August 705. Although his rule was considered generally successful, especially in containing the Arab threat to the east, he was overthrown by the former emperor Justinian II and subsequently executed. Tiberius was a Germanic naval officer from the region of Pamphylia and originally named Apsimar. He participated in the failed campaign to regain Carthage in 698. The fleet rebelled and chose Apsimar as their leader. Changing his name to Tiberius, Apsimaros sailed on Constantinople which was suffering from a plague and proceeded to besiege it. As emperor, Tiberius III made the tactical decision to ignore Africa, where Carthage was now definitively lost. Instead, he appointed his brother Heraclius as monostrategos of the East, who firstly strengthened the land and sea defences of Anatolia before proceeding to attack the Umayyad Caliphate under Abd al-Malik, winning minor victories while raiding into northern Syria in 700 and 701.